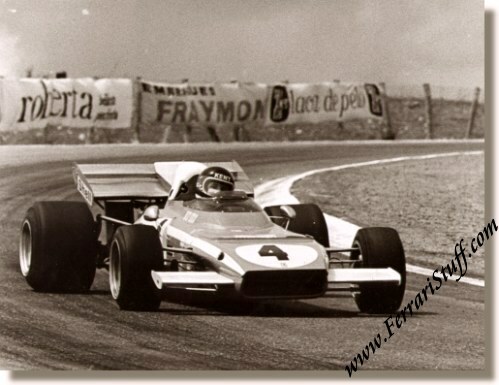 Vintage photo of Jackie Ickx on Ferrari at the Grand Prix of Spain 1972. This is a GREAT shot of Jackie Ickx in his Ferrari 312B2 1972 en route to second place in the 1972 Spanish Grand Prix at Jarama. Jackie qualified his Ferrari on pole position and managed a second place in the race just ahead of team mate Clay Regazzoni while Mario Andretti's Ferrari suffered from oil pressure problem and stopped in lap 23. The victory in this race went to Fittipaldi on Lotus. There are no clues to who shot the photo nor are there any copyright notices on the back of it. Dimensions: approximately 8 x 6 inches or 20 x 15 cm.